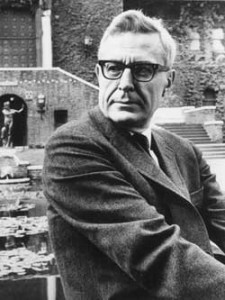 Loren Eiseley was born in 1907. He died in 1977. For many years and until his death, he was the Benjamin Franklin Professor of Anthropology and History of Science at the University of Pennsylvania. A scientist, he was particularly interested in the study of the origins of human kind. A human being must live in the world first, even as he or she tries to understand it. Scientists, for instance, do not get to do their science from outside the context of being human beings. They look at the world from within that world. If we choose to let conjecture run wild, then animals, our fellow brethren in pain, disease, suffering and famine—our slaves in the most laborious works, our companions in our amusement—they may partake of our origin in one common ancestor—we may be all netted together. Darwin’s…comment that we may all be netted together in one gigantic mode of experience, that we are in a mystic sense one single diffuse animal, subject to joy and suffering beyond what we endure as individuals, reveals a youth drawn to the world of nature by far more than just the curiosity to be readily satisfied by the knife or the scalpel. Auden and Eiseley would agree with this sentiment. According to Eiseley, Darwin would agree as well. There is a right way to interrogate nature and there is a wrong way. You are on the wrong track when you end up murdering to dissect. You are on the wrong road when you step out of your own creatureliness, your own status as an animal, suffering with the other groping and grasping creatures mucking about in Earth’s mud. But if you have the feeling that all animals, all living things, have a common ancestor, that we are all “netted together,” as Darwin put it, then you come to your scientific work with a much different sensibility than the person who blithely wields the knife or the scalpel. You’ll be less inclined to “murder to dissect” because you’ll feel a sense of kinship with what you’re murdering. Another way to say this, according to Eiseley, is that everyone—singer or scientist—has a “sense of the holy.” The more you develop your sense of the holy, the more you are actually in tune with what it means to be a human being. And the more you are attuned to being human, the more you are attuned to every other living creature too. It was not the tough-minded, logical inductionists of the early nineteenth century who in a deliberate distortion of Baconian philosophy solved the problem of evolution. Rather, it was what Darwin chose to call “speculative” men, men, in other words, with just a touch of the numinous in their eye, a sense of marvel, a glimpse of what was happening behind the visible, who saw the whole of the living world as though turning in a child’s kaleidoscope. This goes much further than the claim—bandied about rather loosely these days—that scientists like “wonder” too, or that people who study evolution also enjoy flowers. Eiseley is not claiming simply that Darwin had a sense of wonder. He is claiming that Darwin could see truths other scientists could not precisely because he had a touch of the numinous in his eye. When we are attuned to the “weird portentous,” the mystery of being and becoming expresses itself. It may do so in a painting or a poem or a prayer. Or, it may do so in a flash of insight into how living beings evolve, as it did for Charles Darwin.